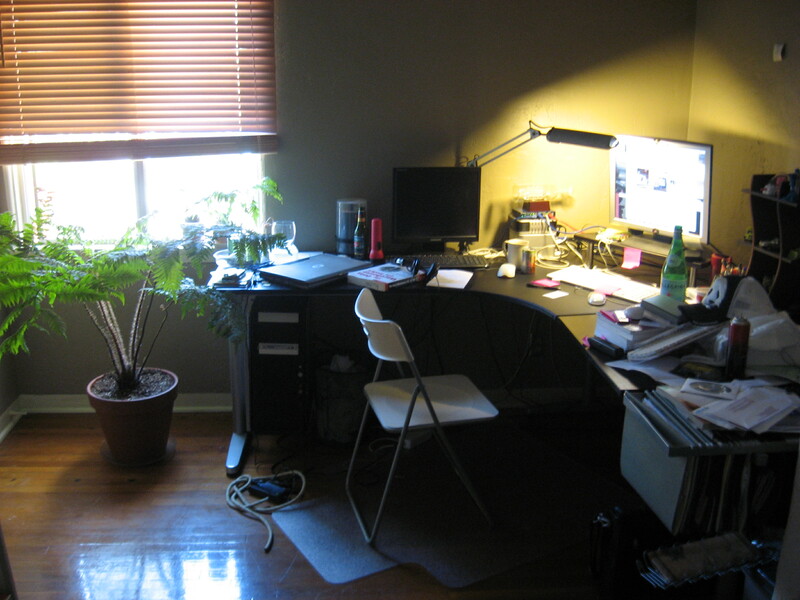 3 months ago my new home office looked like this. I am now done moving in, and it is showing the patina of work. partard: wow, quite an upgrade from the old maplewood house. 1. What was terrible about the Dell? 2. I notice in both you have a flor light over your keyboard pointing at the screen. Is this to see the keys? Doesn't it glare up your screen? Austie Jonez: (1) i bought it on the dell outlet for as much as a new macbook pro would have cost. i put suse enterprise desktop on it. it worked nicely, but the power management didn't work. i close the laptop and it keeps going full blast. also, it is crazy slow. it does this clunky thing where the OS slows to a crawl. I suspect it is whatever problem got it returned to dell in the first place. (2) yeah, it glares either in my eyes or on my screen. i adjust it to stop doing one for the other whenever i get sick of one of the settings. Austie Jonez: Fern. Paltry attempt to offset my carbon footprint. Austie Jonez: terrible decision to buy a dell laptop last year. Austie Jonez: Flashlight for when the power goes out, or I am tracking ants under my desk. Austie Jonez: 17“ Samsung LCD I paid $450 for 4 years ago. Now you can get 22” Widescreen LCDs at best buy for $179. Austie Jonez: AMD chipped gaming box for playing CIV IV, running VMWare sometimes. Austie Jonez: Line for practicing sailing related knots. Austie Jonez: 1 old mac mini, 1 brand new mac mini, 1 external USB hard drive that the macs backup to. Austie Jonez: Can of low sodium V8 vegetable juice because I am on the South Beach Diet with my GF. Austie Jonez: 20" Westinghouse LCD. Austie Jonez: Lately all the notes I take on work calls go on sticky notes. I shuffle through them when I am looking for some bit of info. I also use them as todo lists. This all happened by accident when I buried my notebook under a pile to the right of this. It was an organic evolution of note taking. Austie Jonez: Stack of sticky notes that I shuffle through. Austie Jonez: large stack of used multi colored sticky notes. Austie Jonez: S. Pellegrino Sparkling Water. My lab book that got replaced by sticky notes. I don't know why they are sitting there, I just use the website. Austie Jonez: San Diego Zoo panda hat. Austie Jonez: Shelf of transformers and Gobots. Austie Jonez: Contracts, invoices, bills, manuals. Austie Jonez: really uncomfortable chair from ikea that needs replacing.